I am proud to say that I have gone 59 years without ever having tasted an eggplant. The very name conjures up a purple morning scramble of slime topped with parmesan. Today that all ends. I recently bought a share in a CSA Farm (Community Supported Aggravation) so I could enjoy the healthful benefits of fresh produce free of GMO’s, DDT, herbicides, and anything else they can think of to dump on my food. I envisioned myself eating my weight in raw sweet peas, strawberries, sweet potatoes, green beans, and corn. I didn’t envision my refrigerator being invaded by unidentifiable squash, cayenne peppers, eggplant, and (still to come) kale. I’m obviously going to have to go outside my cooking comfort zone of fish sticks and box macaroni and cheese. I’ve known parents who cook three different meals each night to please everybody. Fortunately, my husband grew up in a low income family of eight children, so there was always some degree of rejoicing if little Johnny was late to dinner. Dave would eat cedar mulch if I fried it in bacon grease. I am also no stranger to poor people cuisine, but my mother simply dumped enough salt on every meal to mask any undesirable flavors. We’re talking oatmeal with a salt content high enough to fry every neuron in your body (and those of your unborn children). 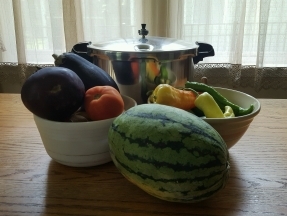 Before my first delivery, I went right out and bought a pressure cooker and canning jars. What I couldn’t foresee was a half-bushel box filled with two pickling cucumbers, a handful of wax beans, six tomatoes, an ear of corn, both green and yellow zucchini (more than I could count), six spring onions, and eight red potatoes. Not enough of any one thing to can, and what the hell are you supposed to do with two pickling cucumbers? Yesterday, I spent about six hours turning five tomatoes and two plastic boxes of cherry tomatoes into tomato sauce. It yielded exactly one half pint. Did you know that when you remove the seeds from cherry tomatoes you are left with a slice of tomato meat the size of a quarter and the thickness of the gold the Franklin Mint uses to clad commemorative coins? Fortunately, I can eat almost anything that is breaded and deep fat fried. Tonight I will be enjoying the healthful benefits of salt laced with a little eggplant, coated in bread crumbs and fried in enough boiling oil to mount a credible defense of a castle wall. Dave will be eating fried mulch.